As you may have heard, Japanese people are very serious about cleanliness. In the movie ‘The Last Samurai’, when Tom Cruise gets captured and taken to the village, he makes a big faux pas by walking into the house wearing his dirty muddy boots, and quickly learns one of the most basic ground rules of Japanese culture — you never, ever, wear shoes inside. Nope, you don’t wear shoes — you wear slippers! And lots of them! 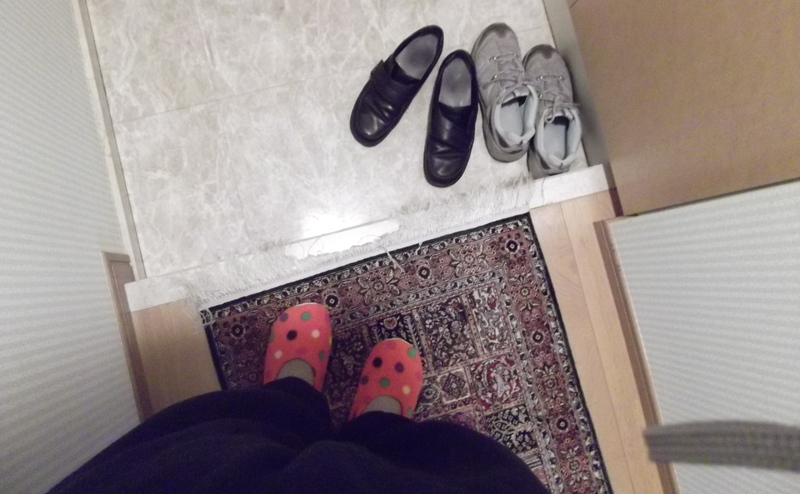 When I come home, I remove my ‘outside shoes’ at the door, and put on my ‘inside slippers’. Then, inside the house, of course you do normal housey things, like liming in the living room and drinking wine. These slippers are fine for this purpose. However, if I need to go outside onto the balcony, I remove these slippers, and put on these ‘balcony slippers’, which are only ever used for the brief moments when I step outside to hang up laundry. 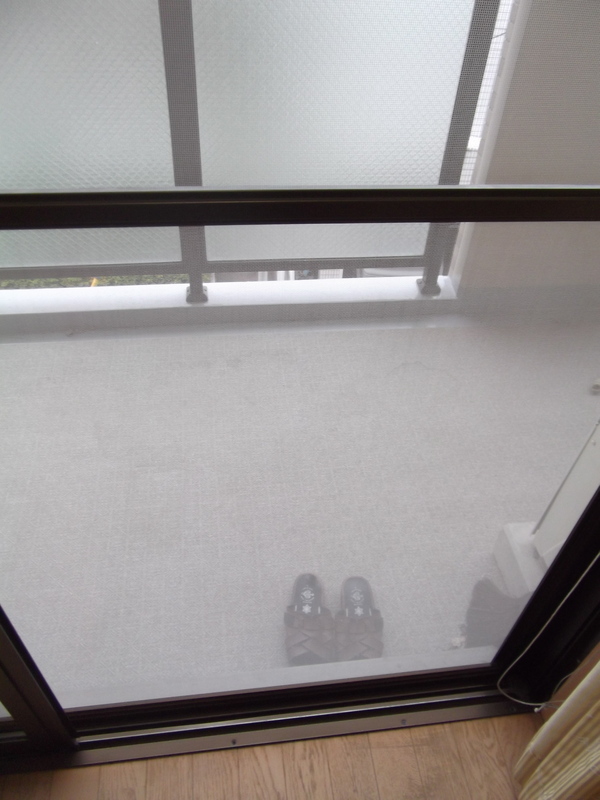 These balcony slippers, since they have been outside and are dirty, must never come inside. They have been banished to the balcony to live a life of isolation. Then, when it comes time to cook, it’s time to change slippers again. 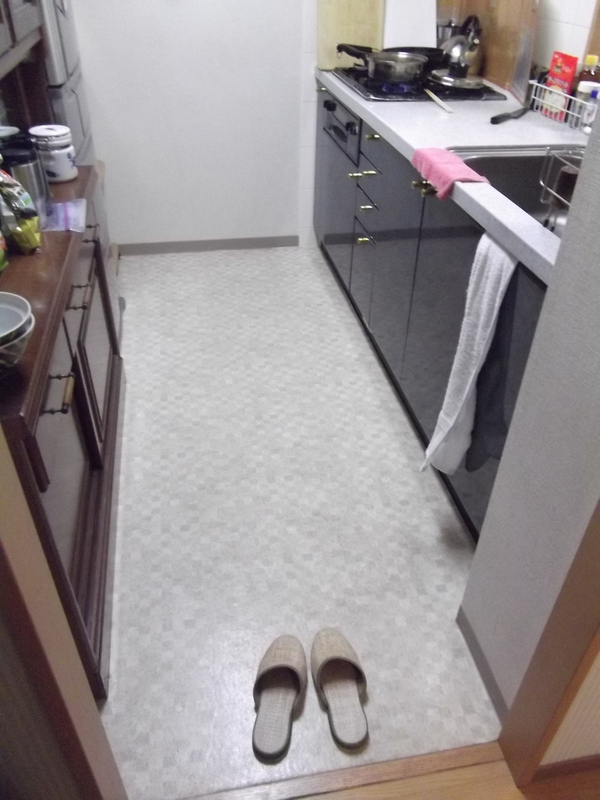 These are the ‘kitchen slippers’ which are used just for cooking, since oil and food and bits and pieces of edible things fall on the kitchen floor during the cooking process, and you would not want to drag all that crap all over your beautiful clean tatami floors, now would you? But wait, there’s more! You’d think by now we would have covered all the basics — indoor slippers, outside balcony slippers, and kitchen slippers. Let us not forget the bathroom slippers! 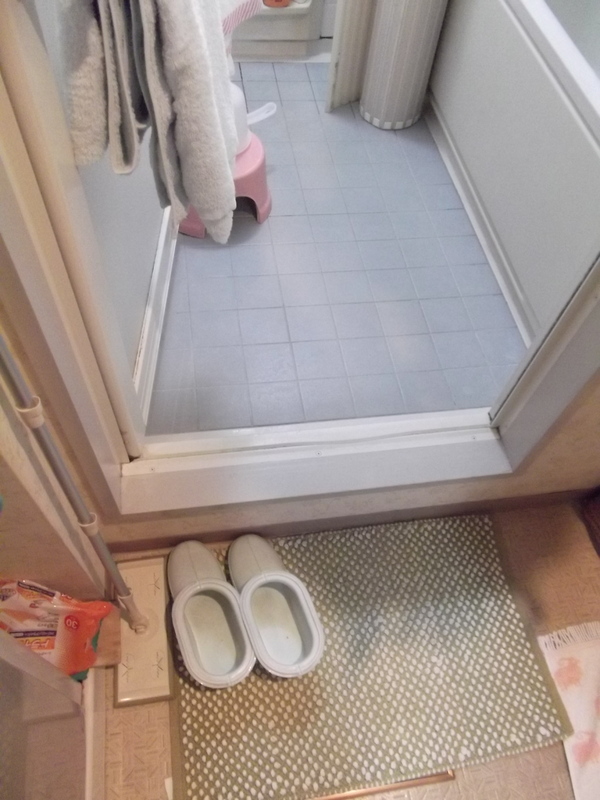 You put these plastic bootie thingies on your feet when you go into the shower room to clean or prepare the bath. They are actually to protect you from getting your feet wet. No, you don’t have to wear these in to the bath. What, are you crazy? That would just be ridiculous! Actually, there should be one more in this set of slippers — toilet slippers to wear in the pee-pee room. In hotels and restaurants, there is ALWAYS a specific set of toilet slippers which you must put on. And rightfully so. Would you want to step in some drunk dude’s shake-off? No, didn’t think so! If you think all these various use-specific slippers are a bit weird, I can tell you about one slipper that is even weirder — the gym slipper. Since gyms are indoors, you are not allowed to wear your favourite Nike running shoes inside if you’ve been wearing them outside. So most people wear either slippers in the gym, or change into ‘indoor gym running shoes’ which have literally never touched the filthy ground outside. I once saw a dude on the treadmill running in his socks! Guess he forgot his indoor running shoes at home? Anyway, I for one like the shoe rules, and have been implementing it for years. When you think about how much nasty crap you walk around in all day, why would you ever bring that into your house? Now when I go home to visit Trinidad, I always have a pair of indoor slippers, and I am sure my family thinks I am barking mad. But I don’t mind. I have happy feet. Happy, and clean. I am with you on this! Seems like basic hygiene to me. I grew up in Trinidad and I grew up knowing to take off my shoes when entering a house (bedroom slippers are the only footwear that are approved for indoor use). It never struck me as different, merely sensible – especially so when I had kids of my own. The thought of them crawling around in all that filth that hitchhikes on our shoes creeped me out. My mother’s parents observed this practice, as do their descendants. I don’t know how or when it originated (they were of Nepalese, East Indian and British extract). I know of people here (my dad’s parents and my husband’s parents included) who don’t do this, but there are some that do and even some who will ask politely if they should remove their shoes. It irks me to no end when I see people going into their bedroom and lying on the bed with shoes on. No offense, but it makes my blood crawl. Agreed — so gross… shoes on your BED!? Disgusting!! I have a lot of Indian friends (from India) who also have a no-shoes-inside policy. Come to think of it, I’ve seen it all over Asia too, like in Thailand. They have a foot thing as well, they believe it is a sign of disrespect to point your feet at someone or touch them with your feet. Definitely must be an Asian thing! Fun to be able to read your blog again. As you know, lots of people in Alaska do the same thing. I couldn’t imagine my kids crawling around, also, and I remember vacuuming and moping daily even then when they were at that stage. Although, I haven’t thought of the kitchen slippers, and that does make sense. Hi Krys, wow a Trini in Hungary! I would love to hear your story about how you ended up there. Glad you can relate to the post about shoes — and yes once you get in the habit of never taking your filthy shoes inside you realize how disgusting it is, actually!